If we could travel back in time 230 million years, we would be surrounded by primitive dinosaurs living alongside giant, crocodile-like animals known as the crurotarsans. They outnumbered the dinosaurs and were even more diverse. But if we then travel forward in time to 200 million years ago, these animals were almost completely gone, with dinosaurs starting a rule of the Earth that would last for over 100 million years. In the past, scientists have suggested that dinosaurs took over because they had a little something extra—a physical advantage—that made them more competitive than the crurotarsans. But a recent study in the journal Science suggests it was luck, not physical advantage, that aided the rise of dinosaurs. The study proposes that dinosaurs benefited from a major extinction that wiped out the crurotarsans and cleared the way for their success. If correct, the study presents new evidence that could change the way scientists think about dinosaurs as the predominant species of their time, said the author. 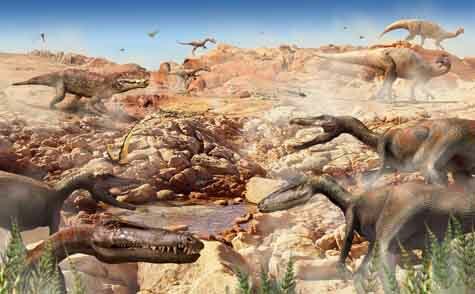 Brusatte proposes that dinosaurs battled crurotarsans over food and turf for nearly 30 million years until the end of the Triassic period, 200 million years ago. A mysterious extinction event spared only small crurotarsans, like the ancient ancestors of modern crocodiles. Even though popular wisdom says that dinosaurs beat out their competitors, the researchers found that they were not gaining ground at the expense of crurotarsans. The groups diverged from a common ancestor around 240 million years ago, but it was the crurotarsans who developed a larger range of body plans and lifestyles. To get a better picture of the two species’ history, Brusatte and colleagues compiled a database of over 400 skeletal characteristics using fossils from the period of time when the two species coexisted. They looked at body types, lifestyles and how much each species’ skeleton had evolved from that of the common dinosaur-crurotarsan ancestor. The authors discovered that crurotarsans had roughly twice as many body types—ranging from massive meat eaters, to heavily armored herbivores, to nimble crocodilelike creatures. They suggest that the crurotarsans had more of an ecological impact than dinosaurs because they occupied a greater diversity of ecological niches. No one really knows why almost all crurotarsans went extinct; possible causes range from asteroid impact to rapid climate change. Whatever the reason, it cleared room for dinosaurs to branch out and dominate the landscape. And now paleontologists are using the disappearance of the crurotarsans to study how massive extinctions reshape evolution to give one group a colossal advantage by entirely removing the competition. Trying to understand why some organisms get a lucky break is like trying to predict which people on a any given airplane will be thriving 25 years from now, said Peter Wagner, a paleontology expert at the Smithsonian Institution. “Your best bet would be to pick those people seated in first class,” said Wagner because they might be affluent people, which could lead to success for them and their descendants. If the plane suddenly crashes, all bets are off. Now a person’s chances for survival have more to do with luck than how well off they were before the disaster, said Wagner. Dinosaurs and crurotarsans were both well off, so researchers are now trying to nail down why the dinosaurs survived the “crash” while most crurotarsans perished. The reason is still unclear to paleontologists why dinosaurs survived and crurotarsans did not. In the future, researchers must figure out how the dinosaurs got the lucky parachute while the crurotarsans crashed. Paleontology helps us understand the human body. Get your degree at T-Rex U. Can scientists create flight as successfully as evolution did for birds? A dinosaur fossil with organs and muscles?